With perhaps the saddest story of Greece, Piraeus history may be one of early prosperity but, ultimately, is one of abject neglect for the most part. The city's history stretches back over 2,500 years to a time representing its origins. This was followed by destruction by the Romans and Goths to eventual redevelopment in the 19th century. Piraeus was a complete town as early as the 6th century BC, owing largely to the brains of noted statesmen Themistocles and Pericles. They built the so-called defensive Long Walls, protecting the road to Athens and securing the port. Of note, early Piraeus was then referred to as Greece's Emporion. The Peloponnesian War in the late 5th century BC led to the Spartans being the first to destroy part of the walls. They were rebuilt by the Athenians not long after, about the time that both the Temple of Aphrodite and the Skevothiki of Philon were established. Tourists can see the Philon ruins today, along with relics from the early days at the Archaeological Museum. Despite the rebuilding of the walls, invasions by the Romans and later the Goths saw their destruction again, although parts of the walls are still visible today. Piraeus in history went into a long period of decline post-Goths, but it never really recovered from as far back as the Peloponnesian War. The Byzantines didn't bother much with Piraeus, mainly due to the distance from their capital, Constantinople (now known as Istanbul). So desperate was the island's decay that its name was forgotten. The Venetians coined it the Lion's Port (Porto Leone) in the early 14th century AD, after the lion statue on the harbourfront. This name was also taken up during the Ottoman period and a mock-up of the statue resides in the Archaeological Museum - the real one was stolen by the Venetians. Piraeus remained a dour place under the Ottoman Turks, the one beacon of light being the late 16th-century St. Spyridon monastery. Another remaining important religious house is the 18th-century Cathedral of Agia Triada, which lies near the harbour and interestingly contains some preserved foundations from ancient Piraeus. Attempts were made to change the course of Piraeus history at the end of the 18th century, although it wasn't until after Greek independence that the city was re-established and designated a mayor. The promotion of Greece's new capital, Athens, in 1832 finally saw the redevelopment of a down-at-heel Piraeus. The city continued to grow from independence as the port of Athens, with the Port Committee coming into being in the year of 1911. The 'powers that be' rebuilt Piraeus in earnest from this time, erecting many neoclassical buildings, including the stunning Municipal Theatre. However, the coming of WWII saw unlucky Piraeus decline once again and it wasn't until the 1950s that things started to show distinct signs of improvement. The history of Piraeus has gone full circle, as today it is one of the world's main ports, handling a massive amount of freight and passengers sailing to and from Athens. Although not the prettiest of Greece's coastal cities, owing to haphazard development and years of neglect, it does have a stunning harbour. 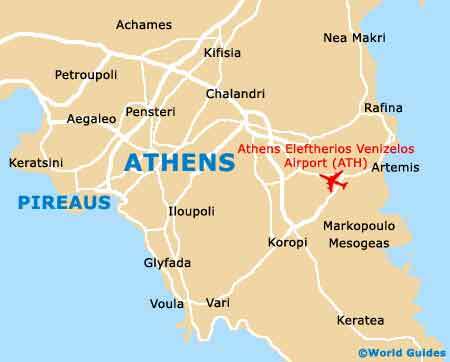 The city is fairly modern and boasts the Peace and Friendship Stadium, which was opened in 1985 and renovated for the Athens Summer Olympic Games of 2004.